The outer shell of polyester Oxford 450 Denier has sealed seams and is 100% waterproof. You'll stay warm with 6 ounce polyester insulation, double zippered storm flaps, and hand warmer pockets. Extra long inseams and elastic snow catcher cuffs keep your boots free of snow and rain. 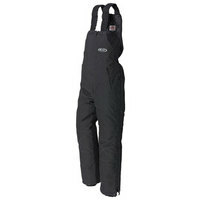 These bibs have adjustable shoulder straps and waist-high, 2-way zippers on the legs for comfort. Available for Men, Women and Youth, these bibs are a perfect choice for anyone who wants to ride through anything. Make sure you have a pair of waterproof motorcycle gloves as well.